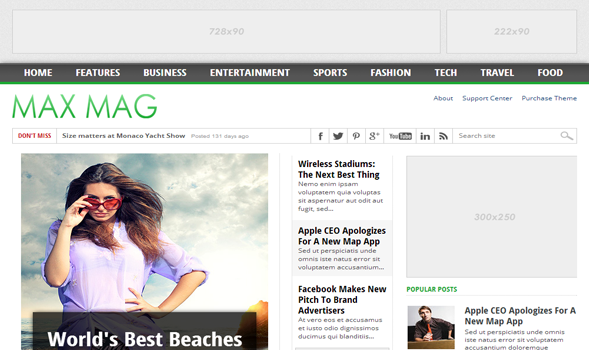 MaxMag is a featured-rich, multimedia and magazine theme. Max Mag is a fully responsive template that has unlimited color scheme with a “Sticky” Menu that scrolls throughout the site. Furthermore, it has many features spots for content as well as Advertisements. All-in-all it is a must-to-have theme that literally takes shape of any kind of a website belonging to any category or niche. The color scheme of the template is also eye friendly and would fresh the thoughts of your readers. Sticky Multi Drop Down Menu: We utilized “Sticky” drop down menu, but a lot of users demanded for a Multi Drop Down menu which could work on three different sub levels. Keeping that in mind, we have added a “Sticky”, Multi-level Drop down menu in this theme. Featured Content Area: This new feature is one of its kinds because we have first time added a splendid widget. This Widget fetches the Posts though Labels and, displays them in the featured content area. Featured Ads Spot: Though, we have always experimented while allocating the featured advertisement spots but this time we have selected the most appropriate locations. We did a research work over the areas which are highly viewed by users. As a result, the theme spots were decided. More Features: Adapted from WordPress, Magazine Style, Fixed Width, white and green color Scheme, threaded commenting system, related posts, Ads ready, SEO Friendly and much more.